Is This Why CRISPR Therapeutics Stock Rallied 21.6% in November? Initiation of the first human trial with the ballyhooed gene-editing technology coincided with a big run-up for this biotech stock. Shares of CRISPR Therapeutics AG (NASDAQ:CRSP) a biotech start-up with fancy new gene-editing technology, jumped 21.6% in November, according to data from S&P Global Market Intelligence. The stock took flight after Nature reported Chinese researchers became the first group to inject a person with CRISPR-Cas9 modified cells. In late October, a group of Chinese investigators became the first to inject a human patient with cells containing genes edited with the CRISPR-Cas9 techniques central to the Swiss biotech that bears its name. The group isn't affiliated with CRISPR Therapeutics or its U.S. peers Intellia Therapeutics (NASDAQ:NTLA) and Editas Medicine (NASDAQ:EDIT). Reports that the treatment went smoothly, though, alleviated fear the unproven tech might prove instantly intolerable in human studies. It's been a wild ride for all three publicly traded CRISPR-based start-ups. Shares of Editas and Intellia have fallen about 58% and 26%, respectively, since their initial public offerings earlier this year. 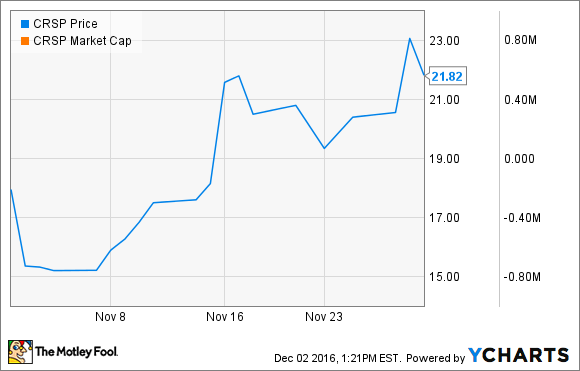 CRISPR Therapeutics, though, bucked the trend with a 46% rise following its IPO in October. The Chinese vanguard's foray into lung cancer is not a direct competitive threat to CRISPR Therapeutics' pipeline. CRISPR Therapeutics will target cystic fibrosis in partnership with Vertex Pharmaceuticals. Meanwhile, a joint venture with Bayer will explore the technique in blood disorders, blindness, and heart disease. Its U.S. peers, though, might run into competition with the Chinese group's cancer-fighting immune cells. Through a partnership with Juno Therapeutics, Editas is expected to produce immune cells modified to attack tumors. Intellia's collaboration with Novartis is also thought to be geared toward cancer-fighting immune cells. Before investors read too far into the dosing of a single patient with CRISPR-cas9 edited cells, it's important to understand just how early it is in the game for CRISPR Therapeutics. While editing genes with this technology is simpler and arguably more effective than previous methods, plenty of hurdles remain. We still don't even know if any CRISPR-based candidate will actually work in humans. I think they will, but it will be a while before we have a proof of concept in any indications. Further ahead, new drug launches can be even more unpredictable than clinical trials. Withdrawing, modifying, then replacing a patient's own cells presents enormous logistical challenges. Convincing regulators a consistently safe and effective product can be produced with such a complex manufacturing process can be time-consuming and costly -- and even then, commercial success is no guarantee. While this new gene-editing technology is very interesting, investors might be better off watching from a distance.